Sleeps 3 - the cottage has been redecorated and represented for 2018. It is the perfect hideaway for couples with the added benefit of a good sized single bedroom. 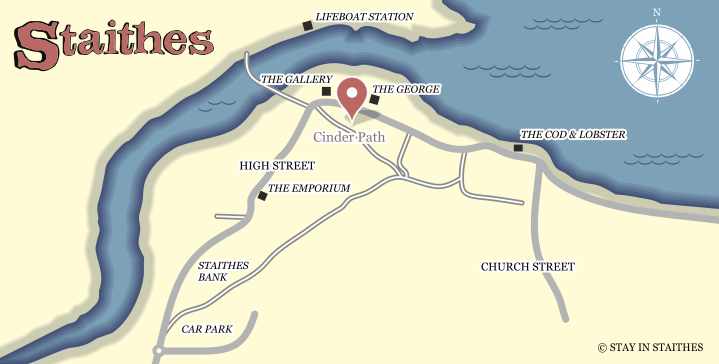 Cinder Path is an unusual two storey cottage set above the village with lovely top floor lounge and views across the roof tops to Cowbar cliff, Staithes harbour and the sea beyond. It is located on one of the many cliff top paths that surround the village, but is also conveniently just off the main High Street. The cottage has storage/electric heating throughout and is a cosy retreat whatever the time of year. Free Wi-Fi access. Please note that the internal staircase is steep and may not be suitable for people with mobility issues. Short term parking is available in the High Street for unloading and the main car park is a 5-10 minute walk from the cottage. We provide one parking permit when charges apply March to October inclusive. The harbour, local pubs and amenities are only a short walk away. Please note that you will have to climb up a short flight of steps to reach the cottage. Ground Floor – the cosy, well equipped kitchen/diner with dining table to seat up to 4. Electric cooker, microwave and fridge with freezer compartment. Bedroom 1: spacious king-sized bedroom with unusual antique metal bedstead and extra deep comfy mattress, antique dressing table, chest of drawers and TV/DVD. Bedroom 2: good sized single bedroom with chest of drawers and wardrobe. Both rooms have sash windows to the front with elevated views across the High Street towards Cowbar cliff. First Floor – living room is the perfect space for relaxation with sofa and two very comfortable armchairs; extensive local art collection; TV, DVD, Bluetooth music speaker; electric fire and Wi-Fi router. There are full height Velux windows set in to the eves from which you can enjoy the magnificent views out towards the harbour. Good sized bathroom with full sized bath with electric shower, sink, toilet and heated towel rail.